Body image issues, we have all had them at some point in our lives and may continue to have them our entire lives if we aren’t proactive about building up self esteem in ourselves and in each other. Have you ever counted how many times in a week the thought, “I feel fat” drifts through your mind? Sometimes in bold letters screaming at you and at other times just tiny little letters drifting silently by yet, still there. No matter what the reality is of how much actual fat you may or may not have on your body the same thoughts go through just about everyone’s head at some point. I’ve had friends throughout the years that were so beautiful and thin yet had severe body image issues to the extent that at times they wouldn’t even go out at night to socialize because they felt fat in their clothes. For some people the body image issues may not be as severe and only crop up ever couple of weeks depending on the hormonal cycle and for others it could be every few weeks. I am a health and fitness expert yet, I have these thoughts at times myself, I had them much more often when I was younger and unsure of myself than I do now but, they still flitter through my head at times. Do you compare yourself to others around you wishing you had their abs, legs, height or skin coloring? Having these kinds of thoughts are such a waste of mental energy and time. They will only lead you to becoming more depressed and down on yourself. Every BODY is different and unique. 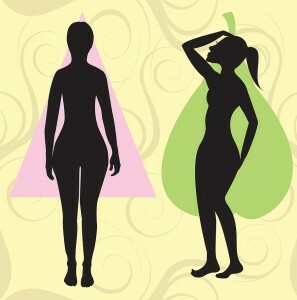 Whatever your shape we all have wonderful qualities and attributes and can be the best at any age or stage of life. It’s just a body and it will age and wrinkle at some point but you can still be strong and healthy throughout it all with class by having a better mindset and not comparing or thinking negatively about yourself. As I got older I realized certain truths about myself in that I may have been feeling fat or ugly at times but the reality was that I didn’t want to deal with some other issue so, I chose to focus on the one thing I felt I could control. The one that seemed easiest for me to change. If my ‘body image’ issues were negative for some reason on a particular day then I could simply eat better and exercise harder that day, easy enough to control, yes? Or does it end up creating an unhealthy -food/exercise cycle? Now let’s go deeper, something I realized when I was quite young and has really helped me along the way when I’m feeling negative about myself or my body and that is; no matter what I do, my body will age and wrinkle, it will change but, my spirit is everlasting and will go on after my body has been set into the ground and decomposed. My spirit does not age nor does it get ‘fat’ my spirit is very important to feed as well as my body and, to solely work on my physical body worrying about it having a little extra ‘fat’ only leads to a miserable existence and a wasted life not to mention, never having an appreciation for the young, healthy and, unwrinkled body I have now (okay, maybe there are a few wrinkles). There is so much more to life than worrying about ‘fat’ all the time and, so much to learn that cannot possibly be learned in just one lifetime. Who really cares if someone else thinks you don’t have the right body type for what they may perceive as attractive or if you have too much fat in your stomach area, hips or thighs for their liking? Why in the world would you let a low opinion of someone else have such an impact on you? What matters is how you see yourself and how you make your body the best you can because it is meant for greatness. Greatness that only you can find within yourself and not from outside of yourself. There have been many times over the years that others have given up on me before I did, I had to find my inner perseverance and belief in myself to succeed not to mention I had to work on my own body image issues to make them more positive and loving. You have to believe in yourself and the rest will fall into place. Own yourself, find your passion, go after it without fear, that is how you find happiness and true health. Health is a balance of mind/body/spirit and not just the body. Males face a unique struggle because society has evolved to tell us that to have body image issues is a sign of weakness. I have had male tell me they are afraid their wives will leave them, they will lose their jobs, and that their sexuality will be questioned if they reveal their eating disorder. Yes, very true. Sadly, it’s a societal issue now. A once in a lifetime adventure in Ecuador with my very good friend. Myofascial stretches utilizes precise postures and highly coordinated movements to target the fascia surrounding particular muscles and joints.